An Organization record represents a real enterprise, business, firm, company or another organization, to which the users belong. Creation of new organizations is only available in the Enterprise Edition. Go to System → User Management → Organizations. Click the Create Organization button. Current status of the organization. Name The name used to refer to the organization in the UI. This is the only mandatory field. You can also add a text description of the organization. 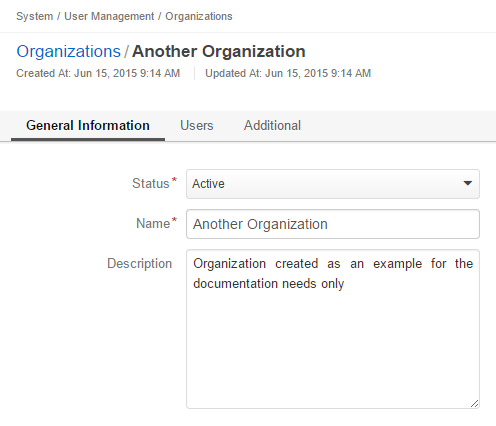 Check/uncheck the HAS ORGANIZATION box, to assign/unassign a user to the organization. Please note that the “HAS ORGANIZATION” check-box defines if the user is assigned the organization role that you are editing/creating. In the “Additional” section, you can define if the organization is a system organization. In the enterprise edition, all the organizations available are displayed in the Organizations grid (System → User Management → Organizations). Get to the Edit form of the organization: . Get to the View page of the organization: . In the community edition, you can only edit the organization name and its description. To get to the edit page, go to System → User Management → Organizations.